Slip these pearls onto wire: 1 gold, 9 white, 1 gold and 8 white. Fold wire in half at center gold pearl. Make sure ends of wire are even. You should have 1 gold and 9 white pearls on the left side and 8 white and 1 gold pearl on the right side. Slide the left wire through the 8 pearls on the right. Since the wire is going through the pearls for the 2nd time it is best to keep the wire straight. Instead of pulling the wire through each pearl, slide all the pearls onto 2nd wire, then pull both wires until pearls come together. Try to keep the wire as even as possible. Slip a gold pearl onto each wire, then slip 7 pearls onto whichever wire is shorter. Fold pearls over toward the previous row, then slip the other wire through the pearls just as you did before. Repeat (step 4) five more times, each time decreasing 1 white pearl. Don't forget to add a gold pearl onto each wire before the white pearls. To attach the bodice pearl to the skirt, slip a gold pearl onto each wire, then slip the 10mm pearl onto one wire, next slip the other wire through the same pearl from the opposite direction. To make the wings: slip 10 pearls onto one wire, the slip the wire through the bodice pearl. Do the same with the other wire. Pull both wires until the wings are snug. To attach the head and halo: Slip the 18mm pearl onto both wires, then slip 9 gold pearls onto one wire. Twist the wire (with the pearls) around the other wire to form a tight circle. Trim off excess wire. 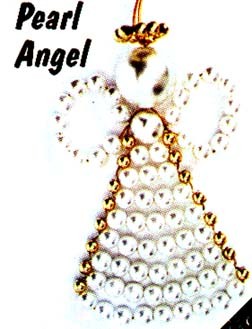 Use 12" piece of cord to hang the finished angel. Children's Craft Kits, Craft Kits,Instruction Booklets, Beady Critters, Sports Shooz, Endangered Young 'Uns, Mega Fun Paks, Legends, Alpha Signs, Bits & Pieces, Bead D'Lights and Memory Makits Available through Enterprise Art or your local craft store.